You must be 25 years old to rent this condo. This third floor condo in the Dunes condominium, located on the west side of the island, has all the comforts of home, including wireless internet and DirectTv, along with a view of the blue waters of the Gulf of Mexico. The master bedroom is a comfortable retreat featuring a king size bed, private bathroom, and your own tv. If the children are in tow, there are twin beds built in the hallway with individual tvs for each bunk. 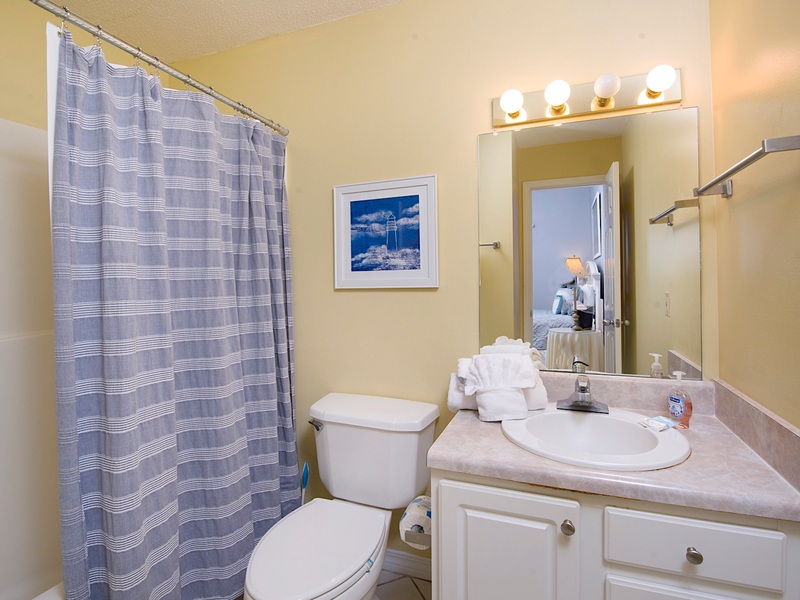 There is another full bathroom along the hallway for the rest of the family and friends. If you decide to cook, the fully stocked kitchen has everything you need. There is a dining table seating four along with three barstools for casual dining. The living room is very comfortable featuring a recliner and a queen sleeper sofa, so this condo will sleep six very comfortably. The sliding glass door opens from the living room to the balcony where you will find that gulf view and breeze. Also from the balcony, you can easily watch your guests swimming in the pool below. The laundry holds a full size washer and dryer along with a pack and play and booster seat. The Dunes has gated parking, a swim through pool, indoor hot tub, fitness center, charcoal BBQ grill, basketball goal and horseshoe pit on the property. For those who enjoy entertainment, Gulf Shores (only 20 minutes away) has a wide variety of attractions, including goofy golf, zoo, water parks, shopping and movies. If you prefer not to leave Fort Morgan and cooking isn't on the agenda, right across the street you can enjoy local seafood or even a very good breakfast at Tacky Jacks Restaurant. Tacky Jacks is located at the Gulf Shores Marina where you can rent jet skis, paddle boards or kayaks. You can also charter a boat for deep sea fishing, dolphin, or sunset cruise. There are other restaurants in the area serving everything from local seafood, steak, pizza, and burgers. Historic Fort Morgan is only one mile from the condo as well as the Dauphin Island ferry. On Dauphin Island you will find the Estuarium which features huge aquariums filled with sea life. For golfers, you can't beat the nearby Peninsula and Kiva Dunes Golf Courses. If you have your bike, there is a neighboring subdivision for light rides or Fort Morgan Road has a bike lane the entire length. Being so close, you could easily ride from the condo to the ferry for a relaxing bike ride around Dauphin Island. This condo is the perfect place for any type of vacation - from adventurous, fun in the sun, or relaxing by the pool. Everything you need for a memorable vacation is right here with the Gulf horizon off your balcony and Mobile bay on your entrance side. Dogs are considered for this property. You must call the office during business hours Monday- Friday 10am-5pm CST, or email to inquire about bringing your furry child. Dog reservations CAN NOT be made online; they will be cancelled. The dog requirements are only ONE dog is allowed at property and the dog must be under 25 pounds. "We loved staying at the condo - decor was very cute and comfortable. The bed is really comfortable. Everything we needed was right at our fingertips. Our little dog really enjoyed sitting in the sun on the balcony. Highly recommend this clean, cozy retreat!" "Thank you for the great review of your stay in Dunes 303! I am so glad you enjoyed your time in Fort Morgan! We look forward to booking your next trip!" "I was pleasantly surprised at this property. The kitchen items are a bit sparse and they need more outlets by the bedsides for our connected world but everyone is super helpful there and the property is beautiful. It is a bit dated but a real value for the price. My main complaint was that the can opener was stripped out and did not work. Overall, I was very happy. It was so pretty - loved the pond with the fish and turtles. Also, the lizards were a big hit with the kids. " "Thank you for your review of Dunes 303. We are so glad you enjoyed your stay! We will get that can opener replaced. Lizards are very abundant down here! Call us when you are ready to come back!" "The condo was very nice and clean. My kids absolutely LOVED the bunk beds with TV's. We really enjoyed our stay there. Amazing over all"
"YAY!! We are so glad to hear that! When the kids are happy, it's a great vacation!!" "I loved our condo. It was nice and pretty everything that was described and I had expected "
"Yay! We are so glad you enjoyed your stay at The Dunes! We would love to have you back again soon!" "Had a great time. Its nice to get away from all the tourist attractions Im Gulf Shores. The condo was clean , and everything you need Is there. I would only recommend bringing extra towels. Plenty of stuff to use for cooking etc. checking in and out is a no brainer. Well be back!" "Fantastic!! So glad you were pleased with your stay! We love the peace and quiet out here, away from crowds. Thank you for the great review! Check out our Facebook page, and leave us a review! Come on back and stay with us again!" "We would return to this rental on our next trip to the Gulf Shores area. The rental was comfortable and overall very clean. We had a minor bathroom issue upon arrival, but had it promptly taken care of by the cleaning staff when notified. The kitchen was stocked well. The decor was modern and master bed was very comfortable (did not use the bunks or sleeper sofa). The condo is in a nice quiet gated community with 2 pools to use. This is where you d want to be if you like feeling like the beach as all yours. There are a handful of restaurants in close proximity but if you're looking for the "action" you'll have to make the 20 minute drive into Gulf Shores. Overall this was perfect for our anniversary getaway." "We are so glad that you enjoyed your stay at The Dunes! It is a quiet and peaceful community with beautiful beaches! We certainly hope that you will come back and stay with us again! Leave us a review on our Facebook page and help us spread the word!" "This was a great choice for a weekend stay. Many units we looked at would not offer only a 2 night stay but we were fortunate that this one did! Very well maintained. The master bed was very comfortable. Excellent communication from property management. Good view of the gulf now but new construction may obstruct that in the near future. Walk to the beach is not too far & we loved that the location was not on an over-populated stretch of beach. It was very quiet on that end of Ft Morgan. Less than a mile from the Ferry that runs between Ft Morgan & Dauphin Island. There were no paper towels or salt, pepper, sugar, or coffee filters, so bring those! We brought coffee filters but the previous guests apparently forgot them & had attempted to use the coffee maker without one so there was a clean up job to do when we went to make coffee our first morning. This was minor though. Otherwise the kitchen is well-stocked with utensils & cookware. We would return! " "Yay!! Thanks, Dianna for taking time to write such a detailed review! We always appreciate the feedback. It is a great, great area to come to. We love being away from the hectic hustle and bustle. We would love to have you out again!" "This condo had everything we needed. Plenty of space for all of us and the bunk beds were awesome also! We didn't have kids but my mom, who is 5'10, slept comfortably in the bottom bunk. The walk wasn't bad to the beach and the view was amazing from the condo balcony. Wifi is available and worked extremely well for all of us! We would definitely go back to this condo again!" "Thank you for writing a review, we like to hear back from our guests about their experiences!!" "The condo was great. The kids loved having their own TV on the bunks. It's within walking distance of the beach. I would have liked it to be a little cleaner on arrival (found underwear on the dresser). It rained most of our stay so we spent a lot of time in the condo. Loved the reclining deck chairs. Would stay in this unit again." "Glad you enjoyed the condo! So sorry, anytime there is an issue like that please call the office, we will take care of it quickly!" "My 4 friends and I took a group trip to Fort Morgan and stayed in this rental. This was to celebrate my 25th birthday and it was a wonderful time. We relaxed on the beach most of the day and were so thankful to have this comfortable place to come back to in the evenings. The beds were extremely comfortable. We were a little worried about the bunk beds, but the length was perfect and the drapes that blacked out the light from the hallway was perfect. Everything matched the description of the property. It was clean. Any questions I had were answered quickly and they made sure I received their responses. For example, I had a question about the keyless entry into the condo. I emailed them and got an email, a phone call, and a text message as I did not confirm receipt of the others. I really appreciated how thorough they were as it let me know they wanted to ensure I had a good stay. We visited the pier in Gulf Shores, went to Live Bait restaurant, and enjoyed a sunset dolphin cruise during our stay. It was a great trip. I would highly recommend this property. " "Happy belated birthday, and we are so glad you enjoyed your stay! " "Every day was a joy! The apartment was perfect, with everything we could possibly need during our stay. If at any time we had a question, or we (as befuddled senior citizens) were puzzled by how to operate the WiFi or other electronic equipment, a staff member instantly came to our assistance. The warmth of the wonderful staff made our vacation unforgettable!" "We are so glad you enjoyed your visit!! Thank you so much for taking time to write a review, we certainly look forward to seeing you next year!" "We were very happy with the rental from Sunset Properties. We stayed at The Dunes in 303 and it was just as advertised! The room was clean and perfect for our stay. We were a short walk to the very private beach. Many mornings we walked the beach and we were the only people there. The gated community keeps this area very private, which we liked. It's only a short 20 minute drive to Gulf Shores and the many things to do there. Our experience working with Sunset Properties was awesome. We would definitely rent from them again. This was a very relaxing and enjoyable vacation, just as we had hoped. We certainly plan on coming back. Thank you!" "Yay!! You have totally made our day with this review! Our goals were met. We helped make your stay an awesome one! Looking forward to your return!" "We had a fantastic stay at Dunes 303. The view from the balcony was awesome. It was a little trek to the beach, but it was well worth it. The beach was super peaceful and very clean. The kids loved the bunk beds with there own T.V.'s. Thanks for a great vacation. " "We had a great time at the Dunes 303. My children loved the bunk beds with the tvs. Overall it was great. The only issue I had was with the king size bed in the master bedroom, it was a super firm/hard mattress and it hurt my back really bad. " "Thank you so much for taking the time to review this property. This property has new owners and if it can be fixed I am sure they will take care of it. Thank you again and I am glad your stay was fun for the entire family." "It rained the majority of the time we were there but to God be the glory we got to do all the activities we had on our list. Would stay again. The King Bed slept like a dream. CAME HOME and bought us all new pillows to try to recreate it. " "The condo was just as described and showed in the pictures. We loved that there were no crowds to deal with. We had two 14 year old boys with us and felt very safe about letting them do things around the resort area without us. The reason I didn't give five stars on the maintenance is that the heat/air unit was not working upon our arrival and it being a week-end it took until Monday to have it repaired. The staff was right on top of it, it just took some time. One other suggestion would be to have the hot water tank checked. We had four people (condo sleeps six) and we were out of hot water after two showers and had to wait at least an hour before the other two would be able to get theirs. Overall a great trip!!! " "Thank you so much for taking the time to review this property. The Owners of this particular unit contacted us after seeing this review. They wanted me to reassure anyone considering Dunes 303 they will be replacing the AC unit before the summer season. They will also be arriving in early May and have the hot water heater inspected at that time. Thank you again for the review, and we are so glad to hear these things did not put a damper on your trip. We love to hear about families of all shapes and sizes having a wonderful time in our beautiful Fort Morgan. Thank you again for all your time in reviewing this property. Sincerely, Sunset Properties Maintenance "
"great condo for our family! Our daughters loved the bunk beds especially with the TVs in each one. Everything worked out great. From the beach to the pool. We had a blast! Will definitely be coming back and staying here again. " "MY ENTIRE FAMILY (19 PEOPLE) REALLY ENJOYED THE STAY. MY ONLY PROBLEM WITH THE CONDO WAS THAT THE PULL OUT BED IN LIVING ROOM WASNT VERY GOOD QUALITY. NO ONE COULD SLEEP ON THAT BED, SPRINGS WERE MISSING. " "Thank you for your review. We love to hear how big groups enjoy staying in our area. It is nice to have your own space and then be able to join together for family activities. We have spoken to the owners about repairing this item. Thank you again for sharing about your wonderful trip with your family. Sincerely, Sunset Properties Staff"
"My wife and I have stayed many times at the Dunes, usually on the 4th or 5th floor. Room 303 was very clean, but we were disappointed in it to some degree. The couch (or Sofa) was very uncomfortable, the sliding screen door wouldn't move, the sink wouldn't hold water (even after it was "fixed." I guess for the price we shouldn't complain, but was as much as where we stayed before. The bed squeaked, the TV's were old and one was broken. I can't recommend this unit, it was a bit of a let down after the places we had stayed previously." "The rooms were nice with clean, comfy beds and comfy living room furniture. The showers were nice with good water pressure and plenty of towels/linens provided. The TV in the bedroom was missing the power button and wouldn't turn on with the remote. We had to put a key into the power button hole to turn it on. The beach was a short hike, but not terribly far away. Other than that, everything was perfect. " "Thank you for taking time to write a review of your stay with us in Dunes 303. So happy that you found the condo clean with comfortable beds and living room furniture and that the linens provided were more than adequate. Sorry to hear about the issue with the TV, we will make sure maintenance checks on that. Yes we do sit about 300 yards back from the beach so it is a short walk but there is parking close to the beach if the walk is too much and Sunset Properties also provides golf cart rides to and from the beach if you call us. Other than that we are glad everything was perfect and that you enjoyed your vacation! We hope you will call us soon to book your next stay! Sincerely, Sunset Properties Staff"
"The condo was clean, amenities were great and the environment felt safe!!" "Thank you for taking time to write a review. We are glad to hear you found your condo clean and that your stay with us was so enjoyable. We strive to provide our guests with everything needed for a perfect visit and we look forward to booking your next stay with us soon! Keep an eye on our website for future specials and upcoming events in our area. Sincerely, Sunset Properties Staff"
"We were very impressed with the staff and condo. Super clean and very well equipped.The only drawback was no wifi and cell phone service was bad otherwise a wonderful experience"
"Thank you for taking time to write a review. We are glad you enjoyed your stay with us and the the condo was perfect for you. Hopefully the cell phone and wifi issues will be resolved soon, there is a cell tower going up on the Indies building and we are working with the owners of the condos to urge them to put wifi in the units that don't already have it. We look forward to booking your next visit soon! Sincerely, Sunset Properties Staff"
"As always, our stay was awesome! It was great to get out of the snow and cold and relax for a week in a beautiful location." "Thank you for taking the time to write a review. Fort Morgan is the perfect getaway for those who are tired of the freezing snow. Please keep an eye out for any upcoming specials on our website and social media sites. We hope to see you on your next beach vacation! Sincerely, Sunset Properties Staff"
"The Sunset Property was wonderful but Dunes 303 was not so great. The sofa and the bed were not vacation friendly. Everything else in Dunes 303 was wonderful. I will stay with Sunset Property again but never again in Dunes 303. The staff are always very nice and friendly. I will recommend Sunset Property to my friends but I will recommend the other units that I have stayed in and not Dunes 303." "Thank you for taking the time to review your stay and this property. We are so glad you had such a wonderful stay. We look forward to seeing you again soon. Wew illcertainly let the owners know about the sofa's they are fairly new though so I do not anticipate a change. Sincerely, The Sunset Properties Staff"
"Overall this was a great place to get away. Very friendly folks both from Sunset and locals. We will be back!" "Thank you for taking the time to review your stay and this property. We are so glad you had such a wonderful stay. We look forward to seeing you again soon. Sincerely, The Sunset Properties Staff"
"Great spot, great vacation. The only issue was the shower curtain on the inside was in desperate need of cleaning or replacing. However, with all the other great things about the condo we were able to overlook this and have an enjoyable stay! " "I'm so glad you had such a wonderful time. We have taken care of the shower curtain issue. Thank you for bring this to our attention. But, next time tell us when you have an issue. We do our best to fix situations right then!!! Sincerely, The Sunset Properties Staff "
"Overall we had a good time & stay. The condo was not up to par on cleanliness, especially the bed linens. The view & the walk is not what I expected & didn't expect to see beach houses directly in front of me. The Sunset Staff are great people & very courteous! I recommend this company but not sure that I'd recommend the particular condo we stayed in! " "Thank you for takignthe time to review this proeprty and your vacation. We have spoken to the head of housekeeping about your stay and disappointment inthis property. In the future when you stay with us please contact us immediately if you run in to any issues big or small we will have it fixed ASAP! Sincrely, The Sunset Properties Staff"
"This is the 2nd year we have visited Gulf Shores and my family and baseball team had a great time. The condo was beautiful and very well decorated. It was quiet and everyone was friendly. We will request the same unit next unit. We are evening looking into buying in this same location. Absolutely an awesome vacation . "Thank you for taking the time to review this property and your vacation. We are so glad you had another wonderful stay. We look forward to helping you in the future. If you have any questions about property we are happy to help at any time just give us a call. Sincerely, The Sunset Properties Staff"
"It was the perfect beach getaway. "Thank you for taking the time to review this property. We are so glad to hear you had a fantastic time in Dunes 303! We look forward to seeing you again in the very near future! sincerely, The Sunset Properties Staff"
"This is our second time to Ft. Morgan and our second time to use Sunset Properties. I love how everything with them is up front & honest. You know exactly what is expected & that makes for an easy stay. We had no problems and even wanted to stay an extra night. The office staff helped us with that quickly and professionally. Can't tell you how sad we were to leave!" "YAY!!! I'm glad to hear you had another wonderful stay. Let us know when you can come back to see us! " "The condo was clean, well equiped, and very family friendly. With the beach just a couple of minutes walk from the condo, this was the perfect place for my family to get away and enjoy the ocean."